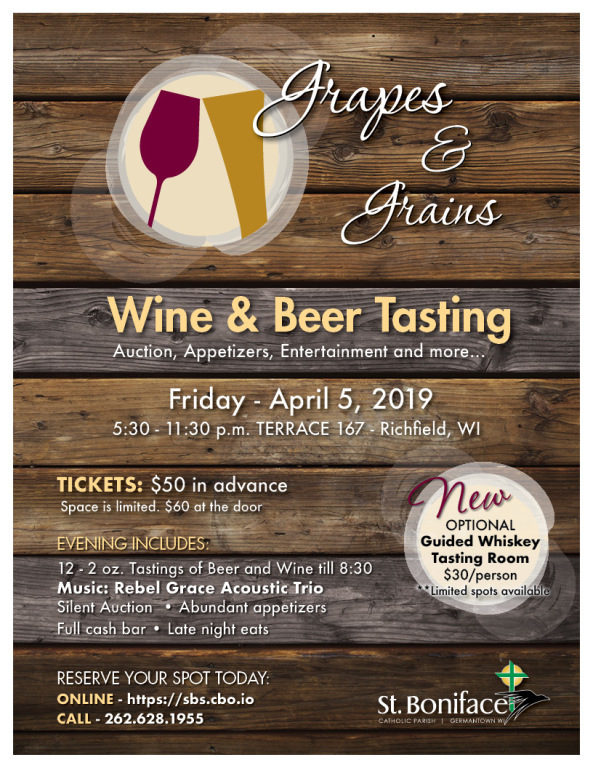 Grapes & Grains-Beer and Wine Tasting Event - This event is held in the year opposite the Dinner Auction. Wines and beers from around the world can be sampled along with delicious appetizers that complement the various selections. This event garners parish and community wide support. Proceeds are applied to the school's annual operating budget. Join us April 5, 2019 for our next Grapes & Grains Event held at The Terrace 167! Fall Festival - Every Labor Day week-end on Saturday and Sunday St. Boniface has a fall festival that serves as the primary fundraiser for the parish. It takes many volunteers to make this run smoothly. The success of the festival is critical to support the parish operations and programs offered each year. If you would like to get involved, contact our parish office at 262-628-2040. Apple Pie Sale - Each October St. Boniface parish and school families work for two days to prepare thousands of fresh apple pies that are ready to bake or be frozen up to one year. Orders must be placed in advance. The proceeds of this fundraiser are applied to the school's annual operating budget, field trips or special purchases for the school. If you are interested in being involved in the pie preparation or placing an order, please contact the school office at 262-628-1955. Dinner Auction - The dinner auction is a semi-formal evening event featuring a dinner, silent auction, classroom gifts auction, voice auction, raffles and entertainment. Proceeds from the event are earmarked for specific purposes to benefit our school and parish community. Monies in the past have funded the computer lab and construction of new classrooms. The dinner auction is held every other year and our next auction is scheduled for the 2019/20 school year. If you would like to get involved to make our next dinner auction a success, please contact the school at 262-628-1955. Scholastic Book Fair - Each November during our school's parent/teacher conferences we hold a Scholastic Book Fair. It runs during the week and after each week-end mass. This event helps promote the love of reading as well as raise funds for our school. In the past we have purchased thousands of new books for our library and classrooms. In addition to all of the great books, we have been able to purchase rugs, furniture and even SMART Boards. If you are interested in volunteering, please contact the school office at 262-628-1955. Bowling - Contact is Clement Gleissner, Jr.. More information will be available soon. Christmas Wreath Sales - St. Boniface Scout Pack and Troup 115 - Orders are usually placed in October of each year and available for pickup in November before Thanksgiving.